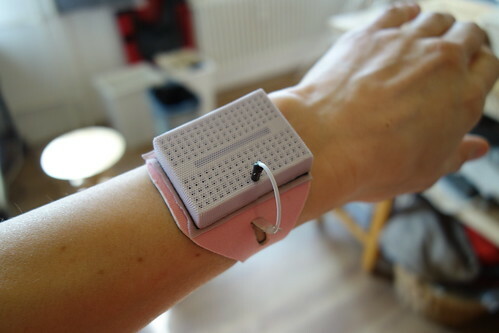 ‘Body to Breadboard Bracelet’ | #WearableWednesday « Adafruit Industries – Makers, hackers, artists, designers and engineers! This ‘body to breadboard bracelet’ is really well made, with the conductive strip on the underside, the mesh covering over the breadboard, and the adjustable snap fittings. Inspired by this upcoming workshop during E-Textile Spring Break titled “Body to Body: RFID + PAN Workshop, where Ingo + Nicole will “…introduce a DIY implementation of these systems to pass data through bodies to other bodies”. 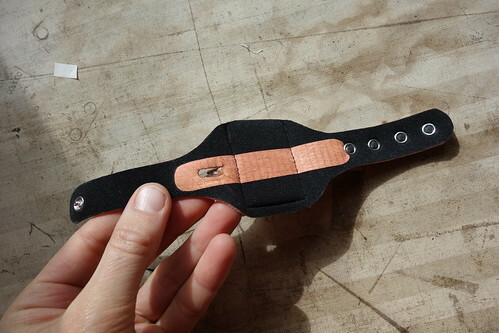 To make the connection between the body and the breadboard, this bracelet has conductive fabric on the back/bottom side of the bracelet which is connected to a jumper wire that can be inserted to the breadboard. I think I am missing something here. Can someone explain what I/O you could do with this? Capacitance? Detect that someone is wearing it?